Cookies are a weakness. Even more so if they’re chocolate chip. It’s rare that I ever find a biscuit that I don’t actually like, but this cookie recipe really is in a class of its own. 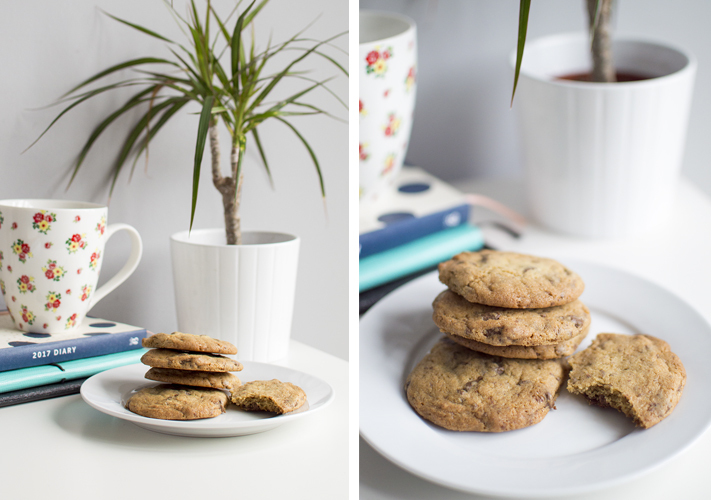 They are both chewy and crunchy, with a very good ratio of chocolate to biscuit that makes it perfect with a cup of tea. This recipe is taken from one of my go-to sites for recipes, BBC goodfood. They claim to be ‘vintage’ though I’m not sure why – classic would probably suit these better. They are exactly what you’d hope for – no frills, no fancy ingredients – just pure, delicious biscuits. They’re also really easy to make and take no time at all, so pretty perfect for a Sunday afternoon activity. Begin by pre-heating your oven to 190C (170C fan) and line your trays with baking paper. Combine your sugars and butter in a bowl, then add the vanilla extract and beaten egg. Sieve in your flour, bicarb and salt. Once that’s been stirred through, add in your chocolate chips. I don’t like buying these pre-made (for some reason they’re extremely expensive) and the cheaper option is to simply buy a couple 100g value chocolate bar for 30p and chop it yourself. It takes a little more time but I definitely recommend this tip if you want to save some pennies. Using a spoon, take small mounds of the dough and add them on to your baking sheets, before baking the cookies for 8-10 minutes and golden brown on the edges. I took these into work and they were a big hit, as well as being a perfect stopgap for when you get home from work and have to wait those excruciating few hours before you start cooking dinner. A definite staple in any recipe book.